We are working on finishing this guide with screenshots and HD video of all skulls, boxes and tactics. This is still work in progress. By the way, sorry for this basic layout. The English version of our site is not completely done yet - but we will launch in the beginning of march, so keep an eye out for www.Xboxlife.com. If you wanna see what we are all about, visit our 5 year old Xboxlife Denmark or Xboxlife Sweden. Sign up for Xboxlife.com - Win prizes! We are about to launch the English version of Xboxlife.com. If you give us your e-mail address now, you will get an extra ticket for our launch prize draw! Submitting your e-mail, will result in getting a confirmation mail from us with an activation link. After that you will *only* recieve one e-mail about our launch. Should you choose not to join our community afterwards, you will never hear from us again. 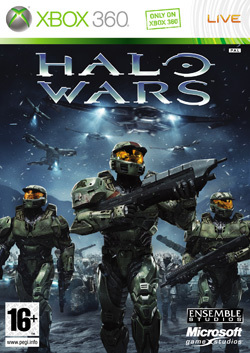 Finding all the Skulls in Halo Wars took us a while to figure out. The trick is really simple though. Basically you have to do the optional objective in each mission, which is about killing a specific number of an enemy unit type. After doing that, a location on the mini-map will flash shortly - keep an eye on this, as this is where you will find the skull. Click the images to see them in a larger version. <-- The picture to the left shows where to find Adam. Basically, open the console right next to the black box, and Adam will come running. Complete the entire campaign in Co-op mode. 5. The Door north of Door 3. Just collect a single Skull in any of the missions. Read more about how to find the Skulls under the Graverobber Achievement. There is a skull in each mission. In order to collect a skull, you have to complete the optional mission, which is about killing a specific number of an enemy unit type. After doing that, a location on the mini-map will flash shortly - keep an eye on this, as this is where you will find the skull. See pictures above for the exact skull locations. When you are returning with Forge and Anders, you cross the Bridge to the east. After all your units have crossed the bridge, wait until the Covenant Units are on the middle of the Bridge, and then use the console below the Bridge to deactivate it. If you do not kill 5 Covenant Units on your first attempt, just turn the Bridge back on, and wait for more Covenant Units to step onto the Bridge. In this mission, no Airlock must be destroyed. This achievement can be quite difficult on the harder levels, so it is recommended to do this on either Easy or Medium difficulty. In order to prevent the Airlocks from being destroyed, you should build Towers around them. When an Airlock gets damaged, use your healing power to regenerate its health points. As soon as you deploy a Rhino, do not let the Covenant destroy it. This one is pretty easy. It is actually only the first and the second Rhino which are at risk.